Fulfill your pet's identification needs with one easy solution! 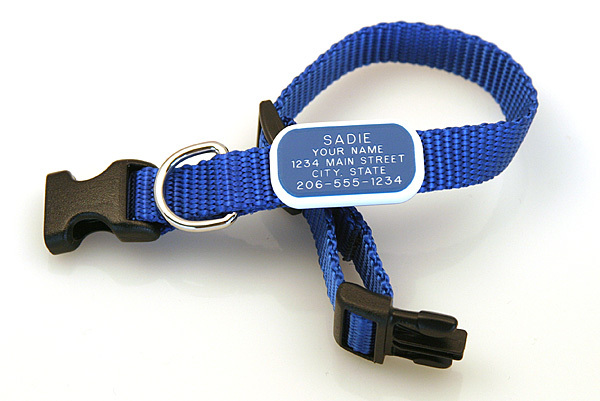 Our ID collars are silent, chew proof and easy to manage. 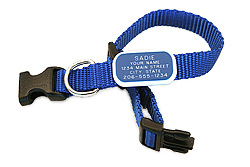 Featuring an adjustable nylon collar with a quick release (not breakaway) buckle and a color matched tag attached to lay flat against the collar. Available in Red, Purple, Blue, Pink, Green, Black, and Bright Pink with Black, and in adjustable sizes ranging from 6-9", 8-12", 10-16", 12-18", and 18-26". The 3/8" sizes are not recommended for walking dogs. Use a 5/8" size or wider if you intend to attach a leash to your pet's collar. See the pull down menus for our full selection. Small size is limited to 4 lines of engraving.